I really didn't want to buy another snowman stamp, but... I did. Yup, it was too cute to resist. Every year the folks at Hero Arts come up with the cutest stamps. Actually, I had a different card in mind when I used my Just Rite stamp for the circle border. I had such a hard time stamping this other image in the middle that I gave up and went for the snowman. And the cap should of matched the scarf but, I was drinking Starbucks coffee while attempting to make this card and there was no way I could of drawn in black lines on the little ole cap with a shaky hand. Don't forget to enter your name on the post below for the cute little stamp set. Sooo cute, Cheryl!!! Remember...don't drink and stamp!!! ha! ha! Cute card, Cheryl. 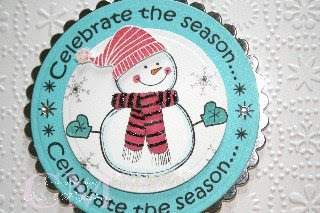 Love the color combinations you used - untraditional Christmas colors but I love it! Hi, Cheryl! The Just Rite stamps are so cute- I love the font. Thank you again for the make and take this past Saturday- you have the best ideas! OMG! I wouldn't be able to resist this snowman too! =) Super cute... Love the color combo. Ahhhh your snowman is cute, and so is your card!! I also can not pass up a snowman...I have issues there. I just recently found your blog. I love your work. Thanks for sharing! I love that snowman! now I'm going to have to go back to the store and pick it up...lol! thanks for all the great cards and wonderful ideas! TFS and inspiring! this is so adorable! 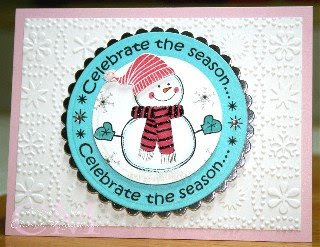 love the embossing on the card ... and that snowman stamp is too cute.